← Olympia Book Fair 2016 Highlights! 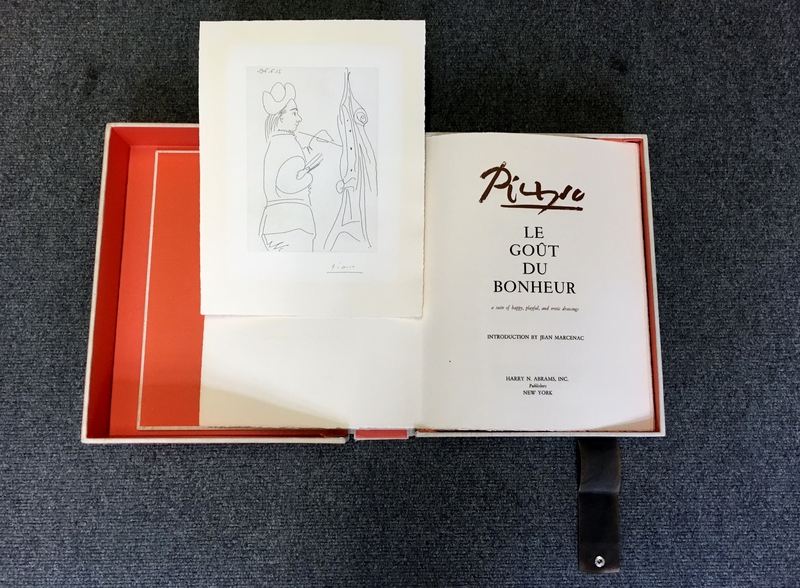 From a total edition of 1998 copies, this one of 666 copies published by Harry N. Abrams, New York (666 copies were published by Editions Cercle d’Art, Paris and 666 copies by Carl Schünemann, Bremen), with an etching by Picasso of a painter at work before his easel, dated 21.7.70 in the plate and signed in pencil. Of the total edition, this is one of 105 de luxe copies, containing the etching and printed on Vélin d’Arches. Loose in cloth-wrapped boards with a reproduction of Picasso’s signature on the cover. Inspired by a book on Marino Marini in which the reproductions were printed using a new process developed by Gunter Dietz, Picasso agreed to have 3 notebooks published using the same method – described by Cramer as ‘a silkscreen in three dimensions’ – that employs the same materials used by the artist, instead of the usual printing inks. Thus 68 drawings were here reproduced using grease crayon, lithographic tusche, lead pencil, charcoal, india ink and coloured chalk. They are in the exact size of the original drawings. Accompanied by an introduction by Jean Marcenac on the subject of desire and love. Join us on stand J26 this Thursday!